So, I turned another year older last week. Some people dread that day as they get older, but I take it with pride—I got to live another year? Beats the alternative! As we’ve noted, my parents came to Austin to celebrate with me. The delicious birthday cake my mom made me. We went to dinner at Technique Restaurant, the local culinary school’s training kitchen (review to come soon). When we got there they pointed us to a table and in the center what did we find? 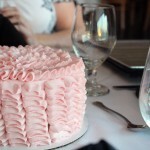 A beautiful pink cake! My mom is a pastry chef instructor at North East Texas Community College in Mount Pleasant, where she teaches students all about baking breads, cakes and other desserts. So she surprised me with a homemade cake. And what I mean by homemade is not what most people mean when their mom makes them a cake! This view shows the pretty buttercream ruffles. This layered cake included vanilla, red velvet and then another layer of vanilla with red raspberry filling and buttercream frosting between each. 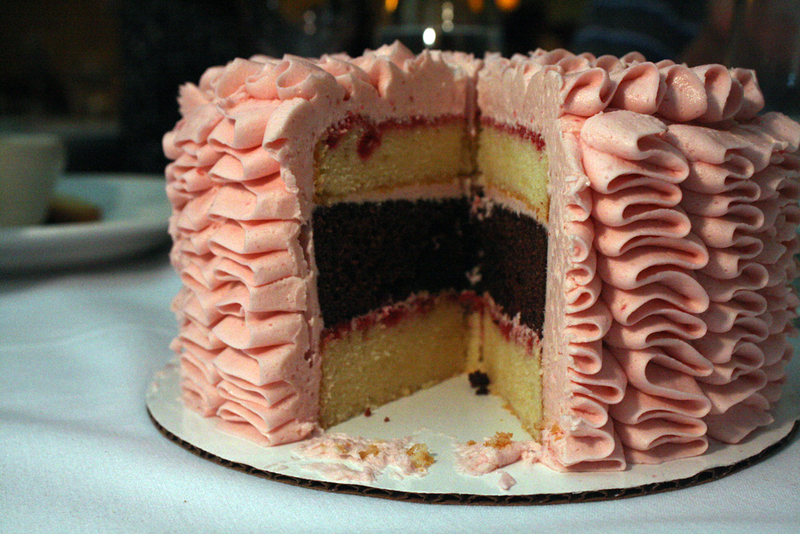 Butter cream frosting also coated the outside in a beautiful design that reminds me of a pink, satiny dress. 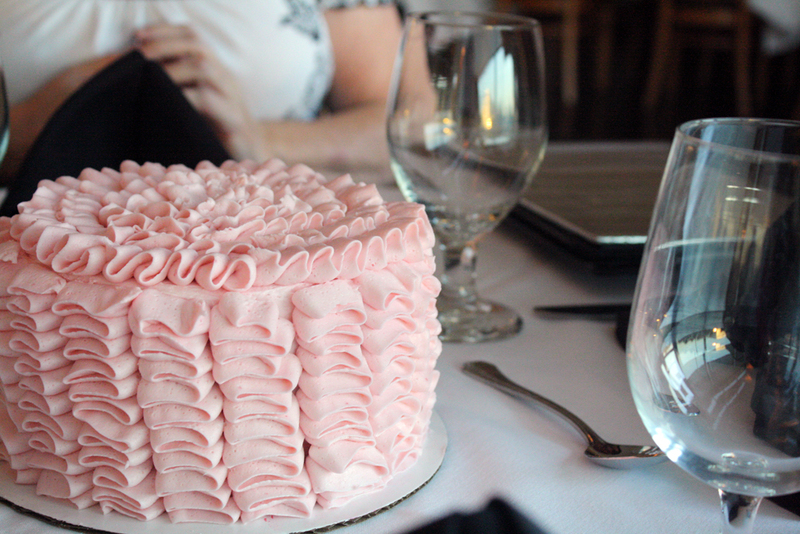 Our waiter told us everyone in the back admired the cake as it was cut and we sent him with a piece of cake of his own. As we walked out of Technique two women stopped us to tell us how gorgeous the cake looked. Everyone enjoyed the cake, me included, and I’m still eating leftovers!